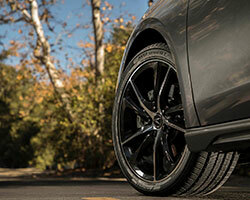 Yokohama Tire is set to introduce their latest offering in the grand touring segment, the all-new AVID Ascend GT™. The highly advanced all-season tire, which goes on sale July 1, will deliver improved handling, long mileage and superior comfort. Available in 50 H- and V-rated sizes, the Ascend GT is designed for luxury sports sedans and coupes, as well as mainstream passenger cars in sizes ranging from 15 inches to 20 inches and is offered with a 65,000-mile tread life warranty on all sizes. -- Shorter wet braking is achieved by an all-new asymmetric tread design with a unique circumferential groove arrangement engineered to provide impressive stopping power and enhanced handling on wet roads. -- Outstanding snow braking occurs thanks to hundreds of 3D sipes and a notched block design, resulting in standout performance for both snow braking and handling. -- Longer treadlife comes from Yokohama’s newly engineered TriBLEND compound and an ultra-square contact patch which produces long, even wear and high-speed stability. -- A much quieter ride is assured by a multi-pitch tread block variation and adaptive outside shoulder blocks which combat uneven wear for a quieter ride throughout the life of the tire.